How long do you think a Bong can be without fish? Not long. With tens of rivers crisscrossing the state and the huge Bay of Bengal in South Bongs have a special knack for fish. Fish is not only a part of the Bengali cuisine, but it’s a part of Bengali rituals, customs; a part of the Bengali life. Fish is considered as a good omen and so in every Bengali wedding a big whole rui or rohu is sent to the bride’s house from the groom’s as a token of bonding between the two families. 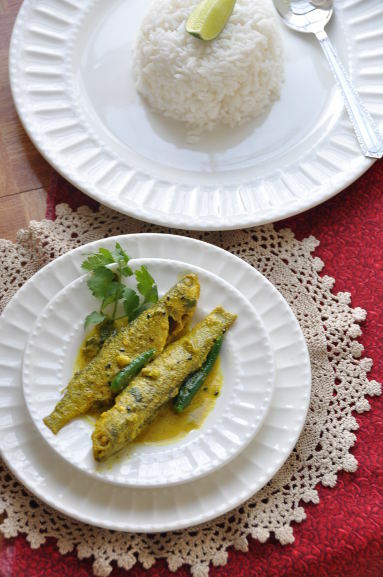 Offering ilish (hilsa) to goddess Saraswati has been an age old custom. There are hundreds of different types of fish that you’ll get in the markets, and more are the varieties of the way these fishes are cooked. To broadly classify the way of cooking fish is a hard task. First, to mention is the daily cooked patla macher jhol. This is the style of cooking preferably the fresh catch, with very little spices and green chilies, garnished with cilantro. Next comes the more rich and spicier version – the jhal jhol and kaliya. Seasoned with onions, garlic and ginger, kaliya are mainly meant for the occasional treats. A slight diversion from the spicy fish preparation is fish cooked in mustard gravy. 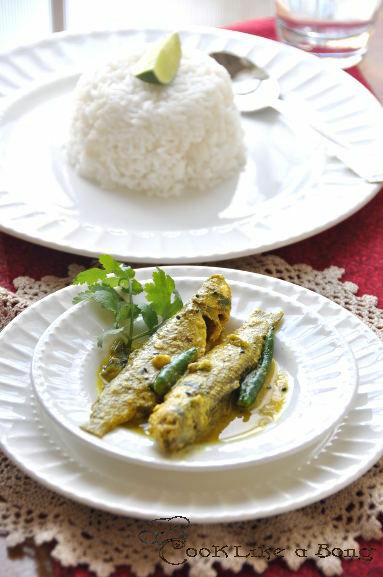 While preparing hilsa this is the most well known technique, but there are smaller fishes like bata, parshe, fyasha and pabda which taste divine is a thick mustard gravy. There are numerous other ways of cooking fish that are prevalent among Bongs. And, when talking about fish and its way of preparation the simple fish fry is a class apart. I remember back in my school days, Sunday was my fish fry day. My mom used to save a piece of deep fried fish for me to gorge on to while watching Alice in Wonderland on Doordarshan. Bata (Labeo bata ) fish is one of the most common small fishes growing in ponds and rivers of Bengal, its is of the same genus as the much more famous rohu (Labeo rohita), and so its tastes quite similar. You can prepare it in a non spicy gravy with just nigella and green chilies, seasoned with turmeric, cumin and salt or make this richer version in mustard gravy. Clean the fish very carefully, coat generously with 1½ teaspoon turmeric powder and salt. Take out of the heat, garnish with coriander if using and serve with warm white rice. How to make mustard paste? Most of you who are away from Bengal will probably have a hard time preparing mustard paste. The traditional mustard paste in sheel nora has almost become a folk lore now. Here’s how I do it. You can get mustard seeds in Amazon or your nearby Indian grocery store. All you need to have is a coffee grinder, which you’ll get in Amazon or other big retailers for $14-20. Take about 3-4 tablespoon of mustard seeds or till the spice level and grind to fine powder. Mix this mustard powder with water, turmeric and salt and your mustard paste will be ready in less than a minute. Hot Tips – Heat the oil to smoking hot before frying the fish, low heated oil makes the fish skin to come out. If you are still unsure, then add a little flour to the fish before frying. And, the trick to have a perfect fish fry is not disturb the fish until one side is fully done. Once the fish is fully fried on one side, it will itself leave the bottom of the wok, and you can easily turn it around. Some people suffer from indigestion after having mustard, the best way to avoid that is avoid the black mustard. Don’t forget to send in your entries to Holi event and Giveaway and get a chance to win vouchers from Flipkart sponsored by CupoNation. 2, For posto paste , can I use the same method , i mean coffee grinder ? And now after reading your posts on mach, I have a clearer picture- carp for rui 😉 .. My hunt begins now..
English mustard wont give the tangy taste to your curry, it is bland when compared to the Bengali version. Yes, you can use the coffee grinder to make the posto powder and then mix it in water to get the paste. Actually I do the same thing. As you have moved to New Jersey, there are numerous Indian stores there. You can get mustard powder in those stores and mix it with water to make the paste. Also, if you have time go to Jackson Heights, there are loads of Indian stores and you’ll get very good fish, even fresh ones. I ll check out the place for sure..
till our next, happy cooking! Ahhh… missing all the Patla jhol and the hundreds of different kind of Bong fish! Have you found any foreigh fish substitute to Bata maach? Do you think that Mackerel will work? I was missing these Bong fishes, but now I have found a Bangladeshi shop which sells almost all types of fish we get in Kolkata. Even though they come in frozen slabs, but still I’m happy. As of now I haven’t found an American version of bata. I dont think mackerel will taste the same. Mackerel is a hard flesh fish. You can try with halibut or any carp if you get. Every time I read your posts, I get hungry.. I remember the patla jhol maa used to cook.. Wonderful post! Thanks Pradyumma. I miss that patla jhol too.